Dana Glenn presents her work, titled “Perceptual discrimination in temperamentally shy children during fear extinction recall” at the Computational Psychiatry Conference in San Diego. To find out more about Computational Psychiatry click [here]. Liliana Lopez wins best poster award at the MARC U-STAR symposium for her poster titled “Exploring the relationship between father parenting and perception of daughter’s personality traits.” Congratulations Lily! 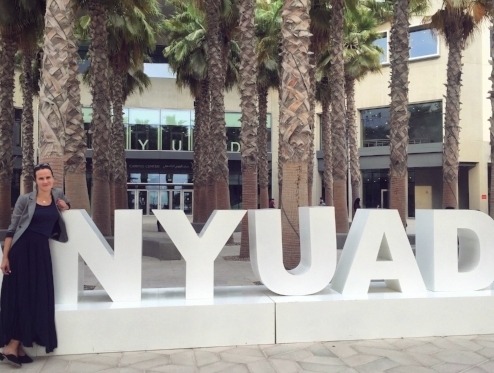 Find out more about the NIH-funded MARC U-STAR program at UCR [here]. KIND Lab welcomes new lab manager. Welcome to Elayne Zhou who joins the lab as a lab manager! Elayne is a recent graduate from Oberlin College with a BA in Psychology. Previously, she was a research assistant at Yale University’s Infant Cognition Center and Pomona College’s Child Attachment Relationships and Emotions Lab. 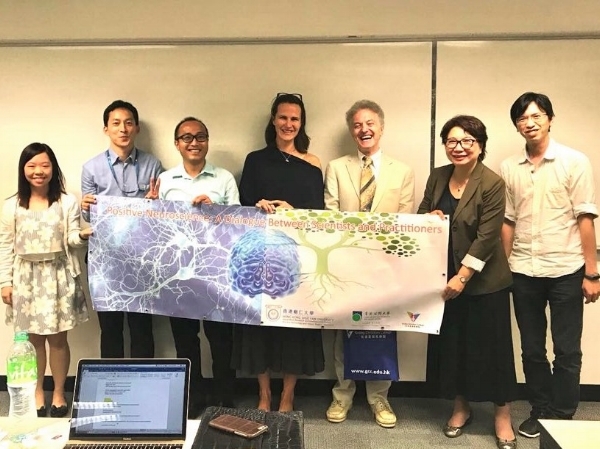 Dr. Michalska gives a keynote, titled “From prosocial to antisocial behavior: A Social Neuroscience Perspective” at the Open University of Hong Kong, China, as part of the Positive Neuroscience speaker series. Pictured here with Dr. Alex Chan (right) and Dr. Adrian Raine (left). Dr. Michalska's research is featured on the Scientific American podcast [here]. Dr. Michalska awarded a faculty travel & research award. Dr. Michalska was awarded a UCR Omnibus travel and research award by the UCR Academic Senate's Committee on Research Grants. More information about the Faculty Grants Program can be found [here]. Liliana Lopez awarded a MARC U STAR (Maximizing Access to Research Careers - Undergraduate Student Training in Academic Research) summer training grant, supported by the National Institutes of Health. Congratulations Lily! Find out more about the program [here]. Dr. Michalska's work on pain expectancy, anxiety, and development is featured in US News and World Report & Science Daily. A recent study by Dr. Michalska and her colleagues at the National Institute of Mental Health finds that expectations influence pain experience in kids with and without anxiety, similar to adults. Read more about it [here]. Dr. Michalska's paper was published in the Journal of Psychosomatic Medicine with co-authors at the NIMH and NCCI. "Anticipatory effects on perceived pain: Associations with development and anxiety" [link to it here]. Dr. Michalska and Dr. Megan Peters in the Department of Engineering receive a Research and Development Collaborative Seed Grant, titled "Neural representation overlap may underlie abnormal fear learning in anxious youth." Find out about 2018 funded programs [here]. Aleksa Kaurin receives the Rosenthal Poster Award at the Convention of the Society for Personality and Social Psychology (SPSP). Congratulations Aleksa! Dr. Michalska co-chairs a symposium with Dr. Harma Meffert from Boystown, NE, titled "Anxiety and Responding to Threat: Neurobiological and Contextual Contributions to Development" at the Society for Social Neuroscience (S4SN) meeting in Washington, D.C. The S4SN 2017 Program can be found [here]. Dr. Michalska's paper was published in this month's issue of the Journal of Child Psychology and Psychiatry with co-authors at the NIMH and VCU. "Anxiety symptoms and children's eye gaze during fear learning" [link to it here]. Dr. Michalska's work on eye contact in anxious children is featured in UCR Today and the Press Enterprise newspaper. A recent study by Dr. Michalska and her colleagues at the National Institute of Mental Health finds that children pay close attention to potentially threatening information and avoid eye contact when anxious. Read more about it [here]. Dr. Michalska awarded faculty fellowship grant. Dr. Michalska was awarded a UCR Regents' Faculty Fellowship grant by the UCR Academic Senate’s Committee on Research Grants. More information about the Faculty Grants Program can be found [here]. Dr. Michalska awarded faculty travel & research award. Dr. Michalska was awarded a UCR Omnibus travel and research award by the UCR Academic Senate's Committee on Research Grants. More information about the Faculty Grants Program can be found [here]. Dr. Michalska spoke at the Southern California Learning and Memory Symposium. On May 16, Dr. Michalska spoke about the neurobiology of fear learning in pediatric anxiety at the Southern California Learning and Memory Symposium, a yearly meeting for Southern California laboratories interested in plasticity and learning. Find out more about it [here]. Dr. Michalska was a featured speaker at the TEDxUCR Conference. On April 16, Dr. Michalska spoke at the TEDx UCR conference on "Using developmental neuroscience to help us empathize with people who don't have empathy." The theme of this year's conference, titled "Amplify" was the magnification of human actions. Find out more about it here [link]. Dr. Michalska awarded a UC Consortium on Social Science and Law grant. Dr. Michalska received a Collaborative Working Group Research Grant from the Robert Presley Center for Crime and Justice Studies for her project titled "Misunderstood: Juvenile delinquency in Hispanic girls," with collaborators Dr. Steve Lee and Dr. Jyoti Nanda from UCLA. Find out more about the Presley Center [here]. Dr. Michalska gave a talk at the Society for Research in Child Development conference in Austin, TX. 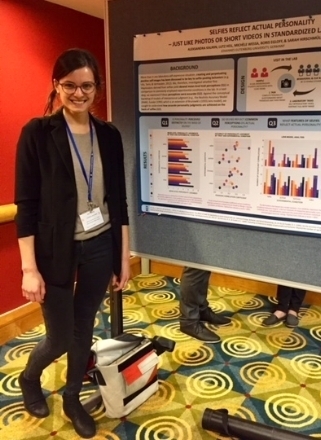 On April 6, Dr. Michalska gave a talk titled "Early childhood shyness predicts neural responses to fear extinction recall in preadolescent youth" at the Society for Research in Child Development (SRCD) conference in Austin. More information about the conference can be found [here].